(Nanowerk News) University of Nevada, Reno Professor Kam Leang, who himself has not missed his monthly ski date for the last seven years, and has been buildng his own skis in his garage for several years, wants to inspire his mechanical engineering students to get interested in real world nanotechnology. With the help of a grant from the National Science Foundation, Leang and his colleagues Jonghwan Suhr and John Cannon are incorporating nanotechnology into current engineering curriculums and are exploring ways to make it more interesting. “The first thing to do is to excite the students,” Leang said of the project. Enter skiing. 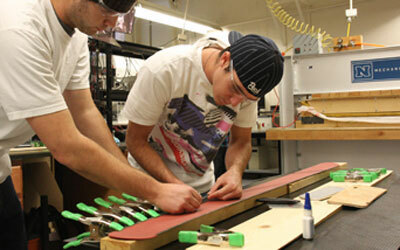 In his senior design class this semester, Leang’s students conceptualized, designed, and built sets of skis using nanotechnology to attempt to improve the skis performance. “When you use nanocomposites [materials that are less than 100 nanometers in length] instead of something like fiberglass, the result is lighter, stronger and can get damper,” explained Leang. Kevin Chafey, a mechanical engineering senior graduating this semester, was surprised to learn of all the ways nanotechnology can be used. “There are so many things you can do with it, so many applications that haven’t been explored,” he said. The class, which was divided into two groups, designed two different sets of skis. One uses a honeycomb-type box containing tiny metal balls, called a particle dampener, on the end of the ski to help dissipate energy and lessen the vibrations skiers feel while skiing down the slopes. The other set of skis folds down to a convenient size that can fit in a car trunk or even in carry-on luggage at airports. Graduate student Brian Kenton, who is the teacher’s assistant for the class, has been building his own skis out of his garage for the last four years. “I’ve made about 12 pairs, but this is definitely the first time I’ve seen one with a particle dampener on it,” he said. Students researched current ski models and patents to be sure they were working on something new, then spent most of the semester designing, building computer models for their skis and constructing a ski press. They built the actual prototypes on Dec. 3. To Stephen Greenan, a senior in the class, seeing the skis come to life has been one of the best parts of the semester. “It’s fun to see your accomplishments transfer from paper to an actual, physical project,” he said. Leang and his colleagues hope to encourage other schools to develop similar programs, using the curriculum he has developed through the NSF program, and to eventually start a national ski-building competition similar to the annual concrete canoe competition that Nevada participates in each spring. According to senior Brett Barlow, it won’t be too hard to get other students involved. Greenan has volunteered to test his team’s skis, but not without a bit of trepidation. While he has faith in the concept of his group’s skis, he isn’t positive that they’ll survive their first test run. Even if the skis don’t make it down the slope, however, the class has met its goal. “We just wanted to get students thinking about nanotechnology,” said Leang. The curriculum isn’t just for building skis. Practical, easy-to-relate-to macro-scale applications such as aerospace structures and wind-energy turbine blades will also be introduced into sophomore- and junior-level courses. The technical engineering challenges and need for improving functionality of all of these applications will be presented and then linked to solutions offered by nanotechnology. The new Energy Efficient Systems and Dynamic Structures mechanical engineering curriculum is made possible through the $200,000 grant from the National Science Foundation’s Nanotechnology Undergraduate Education in Engineering program.